The Target Saver: Target" Schick Razor Gift Sets, Only $3.56 ( Reg. $9.99)! Target" Schick Razor Gift Sets, Only $3.56 ( Reg. $9.99)! Need a few extra gifts? 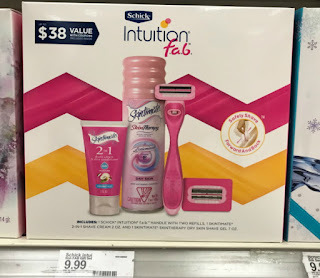 You can pick up Schick Women's gift sets for $3.56 at Target! There is a promotion on gift sets this week: buy one and get one 25% off. Stack the promotion with a new 25% off Cartwheel offer and manufacturer coupons from the 12/2 Smart Source newspaper insert. This is the first time we've seen these gift sets so low before the holidays.